Video games have been an entertainment favorite for the last thirty years and more. With the advancement of technology, the craze has only magnified as new technologies are being inducted every now and then. The graphics used in video games are way more sophisticated now and are constantly pushing the lines of photorealism. The advancement in technology is allowing engineers to pull out graphics from the computers or television screens and integrate them into the real-life environments. The latest technology that has invaded the digital market is further blurring the line between the reality and virtual reality. The technology known as augmented reality is an integration of digital information in the real-time video of the user. The technology successfully enhances the spectrum of virtual reality by alleviating the notions of what you see, feel, smell and taste. In other words, the technology creates computer-generated environments in which real world seamlessly blends. With augmented reality display, you will recognize a virtual picture with informative graphics in your line of view and likewise an audio will coincide with the image you see. This environment is created by the amalgamation of sounds, graphics and haptic feedbacks that resonate the real world. The best part remains that augmented reality takes place in real time, thus producing an extraordinary experience for users. This has encouraged sectors like video gaming and cell phones to incorporate the technology in their applications. As discussed, augmented reality enhances visual reality in a revolutionary way. Thus it produces a wide variety of user experiences. These experiences are generally projected with the different Augmented Reality tools or mediums. Augmented Reality 3D viewer – Such viewing tools with the help of augmented reality technology, places life-size 3D models in your environment. You can see these 3D models in your field of view with or without the use of trackers. Augmented Reality Browsers – With augmented reality browser your camera feed is enriched with contextual information on the view you point your camera at. For example, if a smartphone’s camera is pointed at a monument or building, you will immediately feed with related information about the view like information on its history, location and estimated value. Augmented Reality games – Augmented reality is incorporated smartly in different video games. Such virtual reality games are turning out to provide immersive gaming experiences. For example, there are games like “Pokemon Go”, which is an augmented reality game where you need to capture 3D Pokemon in real life environment. Augmented reality bridges the gap between the digital world and the real world, thus application of the technology is broad and varied. From interactive games, to promotion and marketing of products, to educational resources, the areas in which augmented reality is used are diverse. The advances in both computer technology and gaming engineering have fueled effective application of the augmented reality in the gaming sector. Moreover, as computer power goes more portable and head worn systems get inexpensive, augmented reality games are on an upswing. 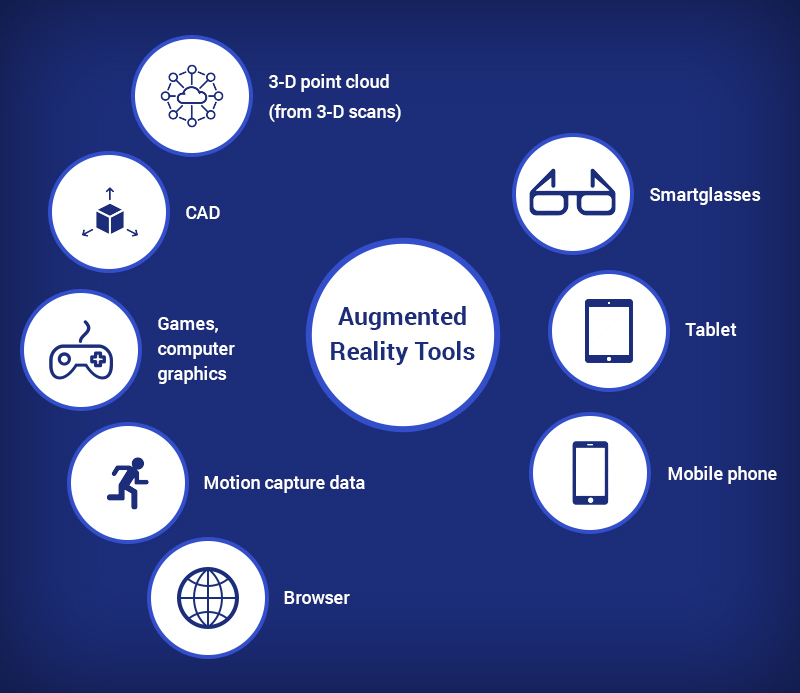 Though augmented reality has been around for more than twenty years, it is only seeing a boom in the gaming market recently, with the release of different applications in Android or iPhone devices like GPS, digital compasses, and powerful processors. For example, there are games like Zombie ShootAR, where players use their mobile phone to shoot zombies which are crawling in and around the players. These zombies are superimposed in the game with the help of augmented reality and has revolutionized the use of the technology in video games. With the popularity and effectiveness of the technology, augmented reality is fast turning out to be the go-to technology in entertainment as well as promotion and advertising. Be it in the 3D representation of Lego products or the movie Avatar, which successfully blurred the lines between reality and virtual reality. With the help of head-worn display, augmented reality can be used in varied different sectors for works. Augmented reality helps superimpose imagery with information in the user’s line of sight. Thus it is very useful in maintenance and repair as well as medical procedures. Moreover, the technology has been effectively used by many mobile developers to offer a better navigation system with the use of GPS. Users thus using their phone’s camera along with GPS can see selected route in front of their car. Another sector which has been hugely benefited by this technology is military and defense services. If you are looking to develop an application with augmented reality, there are a number of platforms you can consider. Such platforms assist in developing AR apps for tablets, smartphones and a range of wearable devices. Some of the best augmented reality platforms are ARPA SDK’s, Metaio SDK, DroidAR, Wikitude SDK, ARLab SDK and Vuforia SDK. Most of the above-mentioned platforms enable support for different platforms including Android, iOS, Windows, Google Glass and Unity. Such platforms are known as native platforms. Then there are app development platforms which is called Hybrid Mobile App Development that enable development of AR app across multiple platforms and are known as hybrid platforms. PhoneGap App Development is one such development practice which can be done in hybrid platform where you can easily develop augmented reality apps. You can create a simple plugin and integrate local racking, Geo-tracking, and the phone camera. Though augmented reality has been there for a couple of decades, the technology has risen just recently. With more and more developing platforms using the technology in innovative ways, it’s time for application developers to instill them in their products and enjoy the perks to the fullest. However, to capture this huge market demand, both consumers, as well as developers, need to educate themselves more of augmented reality and how it can be used to change the way technology is perceived. The opportunities with this technology are wide and with expert developers you can use it to capture the market like no other.